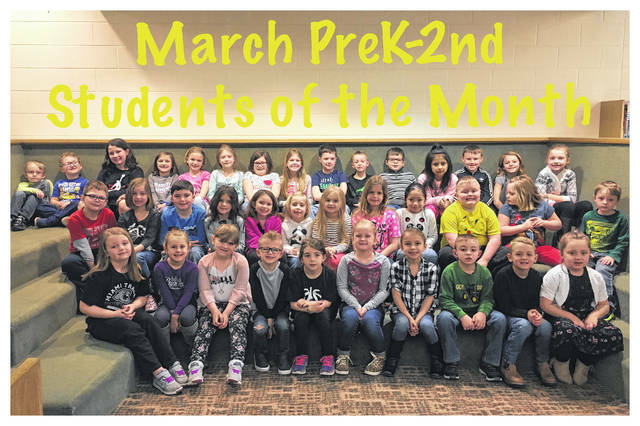 The Miami Trace Elementary School announced the March Students of the Month for the K-2 grades. Front row (L to R): Brooklyn Hagler, Audrey Johnson, Maylynn Axline, Lukas Williard, Delaney Farley, Kenzie Wilt, Emma Marrero, Nathan Hooks, Colton Fannin and Brynlynn Hayes. Middle row: Carson Stewart, Kamdyn Penwell, Harely Boysel, Arianna Poole, Jayle Stires, Addison McClaskey, Kaliana Willman, Serenity McQuade, Yaretzi Utrera Canseco, Xander Cummings, Kylee Leach and Kaleb Causey. Back row: Colby Therrien, Bryant Lemaster, Ava Culwell, Emma Hoppes, Brooklyn Gurr, Cailin Johnson, Bryleigh Carrol, Lillian Bush, Meyer Bloom, Landry Smith, Chance Neal, Allisson Juarez Ramirez, Mack Leasure, Skylar Carlsgaard and Kaylen Pavey. 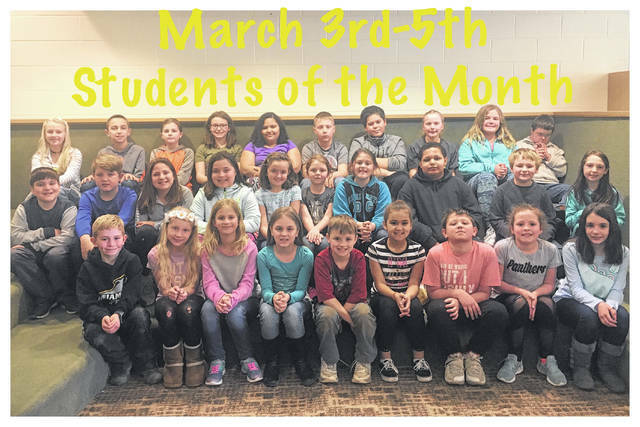 The Miami Trace Elementary School announced the March Students of the Month for the 3-5 grades. Front row (L to R): Kenton Berry, Sydney Strawser, Paige Fitzgerald, Sadie Keller, Noah Wysong, Oliviya Dunn, Jadn Jackson, Landri Adams and Annabel Smallwood. Middle row: Nephi Lankford, Klayton Bellar, Brooklyn Radcliff, Ella McCarty, Karley Hicks, Lilly Capehart, Belle DeBruin, Noah Thirtyacre, William Umstead and Gabbi Thoroman. Back row: K’Lynn Cornell, Trey Robinette, Hayli Maynard, Hunter Johnson, Shyla Montgomery, Walker Glispie, CJ Flint, Carley Payton, Kylie Snyder and Chance Chilcote-Benz. Not pictured: Hayley Rosenberger, Brayden Schiller and Bentley Moore. https://www.recordherald.com/wp-content/uploads/sites/27/2018/04/web1_k-2.jpgThe Miami Trace Elementary School announced the March Students of the Month for the K-2 grades. Front row (L to R): Brooklyn Hagler, Audrey Johnson, Maylynn Axline, Lukas Williard, Delaney Farley, Kenzie Wilt, Emma Marrero, Nathan Hooks, Colton Fannin and Brynlynn Hayes. Middle row: Carson Stewart, Kamdyn Penwell, Harely Boysel, Arianna Poole, Jayle Stires, Addison McClaskey, Kaliana Willman, Serenity McQuade, Yaretzi Utrera Canseco, Xander Cummings, Kylee Leach and Kaleb Causey. Back row: Colby Therrien, Bryant Lemaster, Ava Culwell, Emma Hoppes, Brooklyn Gurr, Cailin Johnson, Bryleigh Carrol, Lillian Bush, Meyer Bloom, Landry Smith, Chance Neal, Allisson Juarez Ramirez, Mack Leasure, Skylar Carlsgaard and Kaylen Pavey. https://www.recordherald.com/wp-content/uploads/sites/27/2018/04/web1_3-5.jpgThe Miami Trace Elementary School announced the March Students of the Month for the 3-5 grades. Front row (L to R): Kenton Berry, Sydney Strawser, Paige Fitzgerald, Sadie Keller, Noah Wysong, Oliviya Dunn, Jadn Jackson, Landri Adams and Annabel Smallwood. Middle row: Nephi Lankford, Klayton Bellar, Brooklyn Radcliff, Ella McCarty, Karley Hicks, Lilly Capehart, Belle DeBruin, Noah Thirtyacre, William Umstead and Gabbi Thoroman. Back row: K’Lynn Cornell, Trey Robinette, Hayli Maynard, Hunter Johnson, Shyla Montgomery, Walker Glispie, CJ Flint, Carley Payton, Kylie Snyder and Chance Chilcote-Benz. Not pictured: Hayley Rosenberger, Brayden Schiller and Bentley Moore.